Have you seen that chevron ribbon - it's faintworthy! (and yes Spellchecker, I do know that's not a real word!) I can't decide which is my favourite colour but this Blushing Bride has got to be in the running. My bag was filled with all sorts of chocolate yumminess so I stamped the tag with an appropriate sentiment from the Oh Goodie stamp set! ... with a hint of what's in the bag on the front! ... which means there'll be lots of happy bunnies all round! Enjoy the comedy bit in the middle where I wrestle with the bunny! My husband likes to regale the family with what he terms 'fun facts' and recently came out with the story that Mel Blanc, the actor that voiced Bugs Bunny, didn't like carrots. My youngest son seemed deeply affected by this. "How do you know?" he asked. " Oh everyone knows that!" said my husband. "Really?" said my son. "Why am I always the last to know?" Have a great weekend and I'll see you very soon. Lovely! So cute, the bunny ears. And the matching card. Suddenly My wish list has grown again. Love that Blushing Bride Chevron ribbon. 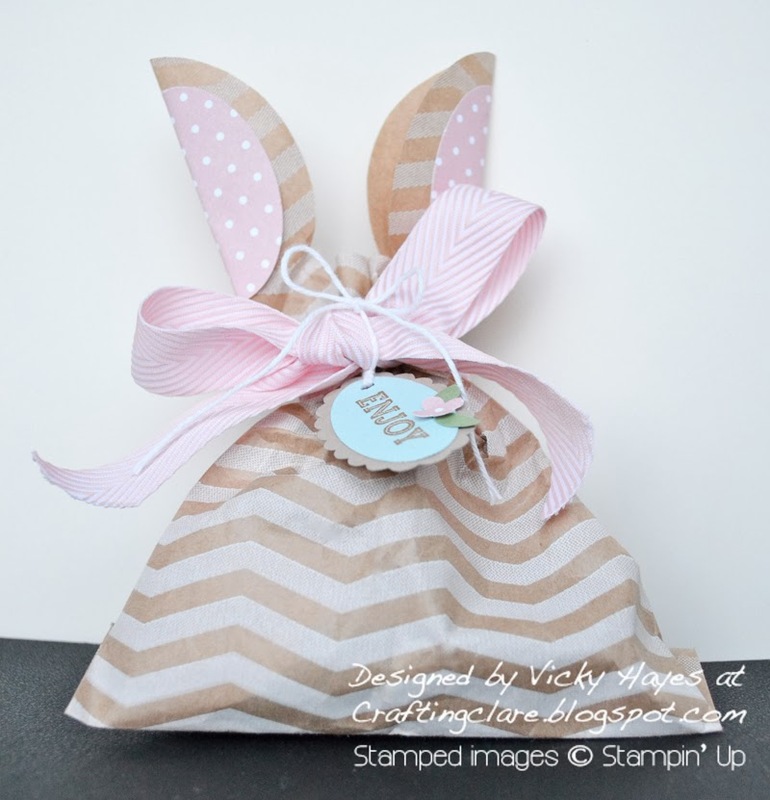 What a great Easter treat bag and card...a fabulous project to do for the grandchildrens teachers for Easter gifts....thank you Vicky for sharing your video..
Well aren't you clever! I'm so glad to see though that I'm not the only one who has quarrels with inanimate objects. Just adorable! I can see me making one with a bunny face too! What a darling project. I love your videos. Your soothing voice makes for enjoyable viewing. Where do you get your brilliant ideas from, this is fabulous and I love your card too, AND the colours.